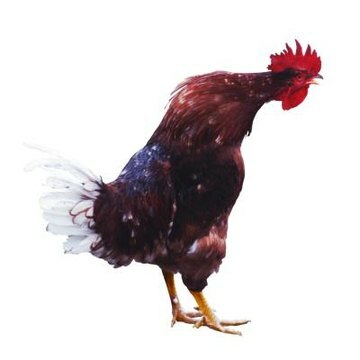 A good rooster should be providing fertilization services to his harem of hens while protecting them from predators. Problems start when Sir Crowlington turns into Godzilla the moment you get too close for comfort. Often aggressive roosters end up being roasted or made into chicken and dumplings. Fortunately, you don't always have to take such drastic measures. It may be tempting at times to confront an angry rooster just to give him a valuable lesson over who's higher in the pecking order. Yet, this only makes problems worse. Your rooster likely will see you as a competitor and will feel more and more compelled to act in an aggressive manner. Instead, try showing him that you're smarter than the average rooster and that there's no actual need to engage in silly rooster games. Your goal is to start sending Sir Crowlington the message that you aren't worth messing around with. Instead of acting like a threatening rooster, show him that you're a caring human being equipped with a superior brain. When you must cross the chicken yard, avoid confrontation by not bearing down on him. If he starts nervously shifting his weight from one foot to the other, a behavior that often precedes an attack, just move away. He'll soon forget all about you. The best way to show your rooster that you're not a threat and that you have superior cognitive capabilities is by desensitizing him to your presence. Every time he approaches you, try tossing a handful of grain his way. He'll likely stop in his tracks and call his harem of hens so he can share the goodies with them. Day after day, he'll should start looking forward to your presence because he has associated it with food. Owning an aggressive rooster can be annoying and sometimes even scary. Yet it's important to understand that the rooster has a noble mission: to protect and to serve his flock from threats. This desire is hardwired, and therefore, no rooster needs to be taught how to watch for danger and fight off predators and other perceived dangers. One-on-one time with your rooster from an early age is crucial to help build a good level of trust. Indeed, the more a cockerel is handled as a chick, the less likely he'll grow into an aggressive rooster. What Does It Mean When Roosters Crow in the Middle of the Night? How Old Do Quarter Horses Need to Be to Begin Riding?